Senegalia laeta was formerly known as Acacia laeta. It was reclassified after molecular phylogenetic studies resulted in the transfer of many Acacia species into the genera Vachellia, Senegalia, Marioussa and Acaciella (Kyalangalilwa et al., 2013). Black-hooked acacia (Senegalia laeta (R.Br. ex Benth.) Seigler & Ebinger, formerly known as Acacia laeta R.Br. ex Benth. ), is an evergreen shrub or tree found in dry climates in Africa. Its leaves and pods provide valuable fodder for livestock. It yields an edible gum, though of lower value than that of Senegalia senegal. Senegalia laeta is a thorny shrub or small tree that reaches a height of 4-10 m. It has a rounded crown and a fissured, grey-green bark that seems to be black when seen from a distance (Orwa et al., 2009). Young branchlets are glabrous, grey-brown or rarely purplish bearing at each node a pair of hooked, purplish black or black, 3-5.5 mm long prickles. There is sometimes a third prickle or a leaf in its place. The leaves are bipinnate with 2-5 pairs of pinnae bearing 3-5 pairs of pinnate leaflets. The leaflets are 6-12 mm long, 2-7 (-10) mm wide, obovate-elliptic or oblong, glabrous or pubescent, clearly separated from each other and asymmetric. The inflorescence is a racemose spike, 3-8 cm long, that bears very fragrant, yellow, white or cream flowers. The stamens are conspicuous and yellow. Filaments are 5-7 mm long. The fruits are pale brown leathery, very flat, dehiscent pods, 3.5-8 cm long x 1.7-2.8 cm broad. The pods can be solitary or borne in tufts. Senegalia laeta yields only few pea-shaped seeds, 8-10 mm in diameter (FAO, 2017; Orwa et al., 2009; Bartha, 1970). 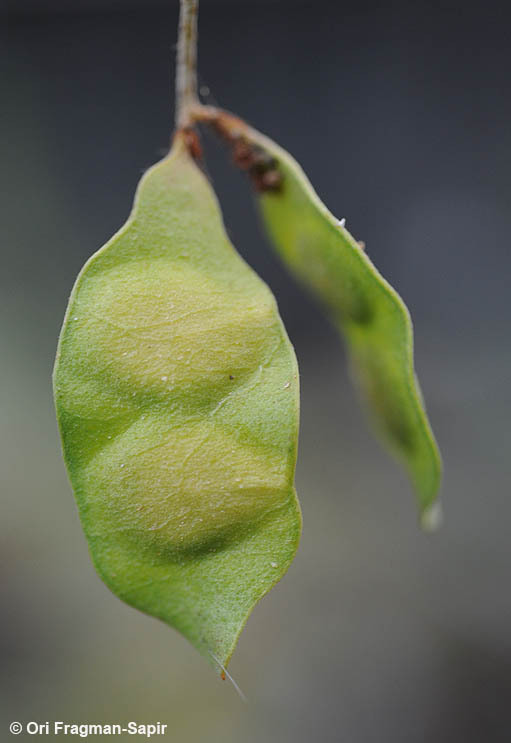 Senegalia laeta is a browse species whose leaves and pods are browsed by livestock. It produces an edible gum of pleasant flavour but of lesser quality than that of Senegalia senegal (FAO, 2017; Orwa et al., 2009; Baumer, 1983). The fragrant flowers make a valuable source of pollen and nectar for bees, beetles and butterflies. Black-hooked acacia provides excellent firewood and charcoal. Its wood is suited to make constructions, poles and fence-posts while its bark is used to make ropes and repair calabashes, or to produce tannins that are used to tan animal skins. Black-hooked acacias make live fences that can be browsed. This species has been used in afforestation programmes (FAO, 2017; Orwa et al., 2009). Black-hooked acacia (Senegalia laeta) is native to subsaharan Africa. It is widely spread in whole Sahel and North Sudan ecozones, though it is absent or very rare in the west of the Niger loop (Timbuctoo). In the east of Central Mali, Senegalia laeta is associated with Senegalia senegal and hybridizes with it. It is common in East African arid and semi-arid lands, in Egypt and in Saudi Arabia (USDA, 2017; FAO, 2017; Orwa et al., 2009). Senegalia laeta is found at an altitude between 1200-1650 m, in places where mean annual temperature is ranging from 21 to 40°C and where annual rainfall is between 250 and 750 mm. Senegalia laeta has low requirements: it is resistant to drought and does well in most soils. However, the tree prefers neutral to slightly alkaline, well-drained, clay or sandy loams (Orwa et al., 2009). In natural communities of acacias of Burkina-Faso, black-hooked acacia represented 8.3% of the total foliage biomass (Le Houérou, 1980). Black-hooked acacia (Senegalia laeta) can be propagated by sowing. Fresh seeds germinate within 4-5 days after sowing. For old hardcoated seeds, prior scarification through soaking in hot water is required. If soaking is not effective the seedcoat can be carefully cut. Seedlings cultivated in pots in nursery are ready to be planted 15 weeks after sowing. It is possible to directly sow the seeds. Weeding is necessary during the two first years of establishment and the trees must be protected from fire and livestock. Stripping the bark for gum should be avoided as it is often lethal for the trees (Orwa et al., 2009). In Burkina Faso, the onset of leaves starts with the first rainfalls of the rainy season, in June, and defoliation starts at the end of this season, in October. In December, all black-hooked acacias are leafless (Sanon et al., 2012). In acacia communities, all trees were cut to feed livestock, including black-hooked acacias whose height was above 2 m for only 20% of the trees (Le Houérou, 1980). Senegalia laeta can nodulate with rhizobacteria and fix nitrogen that can benefit to neighbouring plants (Fern, 2014). It was reported to be slightly less effective than Senegalia senegal in nodulating (Badji et al., 1988). Nutritional information on Senegalia laeta is scarce. The little information available shows that the leaves have a quite high protein content, in the 21-34% DM range, with a low fibre content. In vitro digestibility values range from 50% to more than 80% depending on the method. Information about the use of black-hooked acacia by ruminants is almost inexistant. Leaves and fruits (pods) are readily consumed by livestock, particularly camels and goats (Wickens et al., 1995; Geesing et al., 2006; Al-Mashakhi et al., 2007). 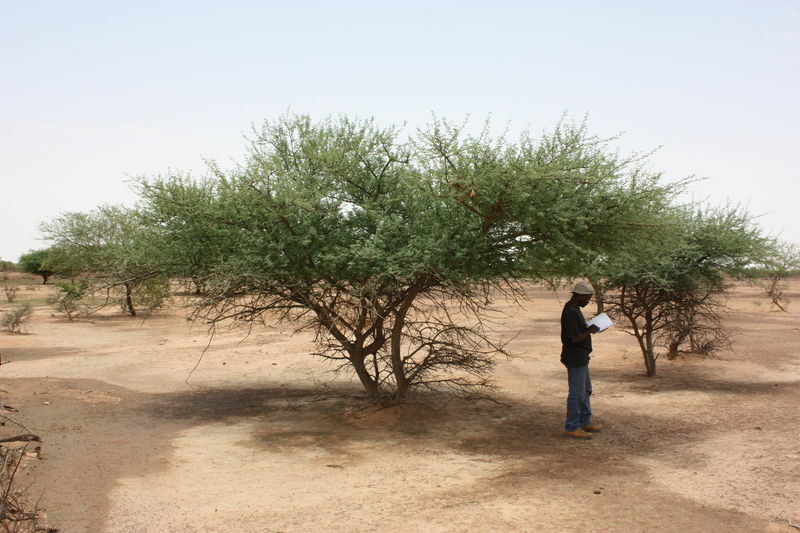 In a study assessing goats behaviour in Burkina Faso, it was reported that black-hooked acacia foliage was not available for browse animals as long as foliages of other acacias (Sanon et al., 2012). From the composition data available, the nutritive value of leaves should be quite high, with an estimated ME value of 12.1 MJ/kg DM. No specific information seems available in the international literature on the use of Senegalia laeta in rabbit feeding (July 2017). Since ruminants readily eat the plant, it is likely that no toxic or anti-nutritional components are present in this plant as far as rabbit feeding is concerned. 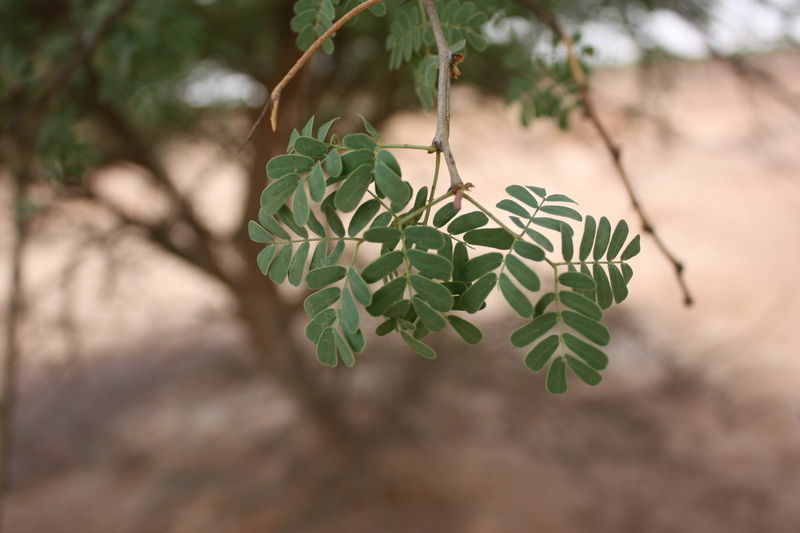 Leaves, pods and seeds of black-hooked acacia could most probably be used safely in rabbit feeding as a source of protein (seeds and leaves) or a source of fibre (leaves and pods), but feeding trials are recommended before any extensive use in rabbit feeding. Early reports noted that, unlike other livestock, horses did not eat the pods of Senegalia laeta (Göhl, 1982).